In this week's episode with Pancharatna Prabhu, we listen to something that could be really helpful for you if you're a book distributor or a preacher in any way. One of the problems in book distribution that we've observed is that devotees who distribute books, they're really focused in giving the books out, but often there's not much follow-up. Even devotees that put in the effort to follow up, it's really hard because you know, your focus is on distributing books and getting as many books out there as possible. It takes time and it's a different type of energy and different types of focus to follow people up. So what is the solution you might ask? Listen to the interview with Pancharatna Prabhu as we discuss the Chant Now online preaching project. Pancharatna Prabhu: And that is a place that people who are completely new to Krishna consciousness, who don't know anything about Krishna, who are not from an Indian background can learn about the very, very fundamental basic concepts that we offer and especially the Mahamantra. So this was, we were talking about it, how to go about doing this. We code named the project Spirituality 101. Krsnendu Das: It's time to get inspired. Join us as we celebrate devotee success stories. Preaching, business, community development, leadership, and personal growth. All from the point of view of Krishna consciousness . Our goal: to help you to make your life successful. Hare Krishna. Here we are again, another episode of Successful Vaisnavas. This is episode 24 about preaching online with Pancharatna Prabhu. And I'm feeling pretty good about myself that we've been able to put out a couple of podcast episodes in the last couple of weeks. And with any luck, this episode will go out to third week in a row. Now, this week's episode is s something that could be really helpful for you if you're a book distributor or a preacher in any way. See, one of the problems in book distribution that we've observed is that devotees who distribute books, they're really focused in giving the books out, but often there's not much follow-up. Even devotees that put in the effort to follow up, it's really hard because you know, your focus is on distributing books and getting as many books out there as possible. It takes time and it's a different type of energy and different types of focus to follow people up. So what is the solution you might ask. Well, the devotees, particularly Pancharatna Prabhu have been hitting up a project called Chant Now. This particular project, the idea behind it is it's a way of cultivating people through an online medium by three courses as well as through personal contact, who are new to Krishna consciousness. So the opportunity here is that for the devotees who are distributing books or preaching in other ways who don't have the time to personally, you know, train devotees and follow-up these new people, they can put them in touch with this Chant Now project and through Chant Now they'll be able to go through some really basic courses. There's different levels of courses as the people progress and then they'll also have people who they can ask questions of and be in touch with who can help to cultivate them sort of remotely through the Internet. And the other great thing about it is they're designing it in such a way that if you refer the people to that program, they'll keep that in mind so that you won't be left out of it. So it's not like, oh, you send the people there and you'll never see them again. But there'll also be a loop where, you know, there'll be a connection with your local preaching center or temple or with you. So this is just a little detail, but I think it's a wonderful opportunity for book distributors, especially the time that I'm publishing this is just before the beginning of the Christmas marathon. So I've given the, let the cat out of the bag so to speak, but I'm sure you'll still find this interview with Pancharatna Prabhu to be very interesting. It tells you a bit of the background behind the project, you know, their mood and philosophy behind how they wanna cultivate people. And you might get some inspiration to do some things on your own. As well as working with book distributors, they're also gonna be doing advertising through social media and other venues like that. Now, if you are interested in developing some sort of online presence, you know, for direct preaching or developing a business that will support your Krishna consciousness, then I've got a webinar coming up shortly. Of course, if you listen to this way in the future, we may even have a course available that you can register for which will take you through these steps. But if you're hearing it soon after it's been released, we'll be holding a webinar where we'll take you through the basic steps that are needed so that if you're thinking about doing some online preaching or starting a kind of a business online that's related to Krishna consciousness, I'll take you step by step through the different steps that are required so you'll know what's needed in order to make it happen. And it's not actually that complicated. As you can see, I've got this podcast and I have some online courses and a membership, so I've had a lot of experience as well as working as a marketer for local businesses helping people develop websites and advertise online. So through that experience, I figured out the basic formula of how to create these businesses so that it can be profitable and it can preach and support you financially. So if that's something that sounds interesting to you, then make sure you're on the email list at successfulvaisnavas.com. And if you're listening to this way in the future, you might find a tab called resources. And under resources it will give you the access to this course or this webinar and other trainings that we might have available. 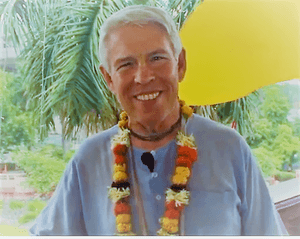 So with that said, let's move into the interview with Pancharatna Prabhu about the Chant Now project and how we can cultivate people to become devotees through online courses. Hare Krishna. Pancharatna Prabhu: I met Srila Prabhupada first in his writings when I visited the temple, the early temples in Toronto in 1970. That was a very transformative experience and I was taught the Hare Krishna Maha Mantra as well. The combination of reading Srila Prabhupada's words, the chanting and the life of the Ashram completely pulled me in. And within about two weeks, I was shaved up and in the Ashram in Toronto. And from there I actually went back to America but then a very short time and spent my formative devotional life in the Buffalo center. And then I first met Srila Prabhupada physically in New York on my, when I was initiated in 1971. Since then, I've served in a variety of ways, up until 1976 in various capacities of management and outreach connected with the New York Center and then came to Mayapur and was, got involved here, was asked to stay and again, have been involved in many, many different kinds of services including construction management, publishing management, strategic planning, fundraising, a whole variety of things, village development, many, many various areas of course, all along, basically my service has been to conceive, plan and launch projects. Most of the time, after things are launched, running for some time I found that I have been handing them over to other people. So that's kinda been my, the way I've been working for the last almost 50 years. And then that's the way I got involved in what I'm doing right now, which is, the broad umbrella is ISKCON online. And this is a new effort that was conceived of by Gopal Bhatta Prabhu and myself to address the deficiencies in ISKCON's internet presence. And so we have been working on this for a few years now, reaching out to devotees, doing some seminars, publishing a newsletter with interesting articles that help people understand what, become more educated about how to succeed on the internet. We've been doing that. And in about two, three years ago, we thought, you know, we want to launch a website that would fill what we saw to be a really major gap in our internet presence. And that is a place that people who are completely new to Krishna consciousness, who don't know anything about Krishna, who are not from an Indian background, who may have been involved in some sort of yoga or whatever, can learn about the very, very fundamental basic concepts that we offer and especially the Mahamantra. So this was, you know, we were talking about it, how to go about doing this. We code named the project Spirituality 101 or just how do you just very, very new how to get started. And then we, a few years back, as we were developing the brand ideas and concepts, it's about 30, 40 devotees in our network that we're involved in discussing all of this. One of them suggested focusing on the Maha Mantra and he came up with the name Chant Now. So we thought that looks good. That looks good. Let's move with that. And so we started designing it. We wanted to have a site which would accomplish a number of things. We wanted to be an online education system. We're inspired especially by Srila Prabhupada's first purpose of ISKCON to systematically educate all people in the techniques of spirit, with spiritual knowledge and to educate people with the techniques of spiritual life. So systematic education today means of course you have, you know, of course there's some reading material, etc. But having a structured course we felt was really needed. To my knowledge, there isn't anything really on the net these days. My godbrother, Sankarshan Prabhu, has been a pioneer in this. And he did develop a email course around the Bhagavad gita and that's been fairly successful. But there's no website with a sophisticated course for new people. The Bhakti Vedanta college has done some things, but again, their audiences is still a little bit more advanced. So we thought let's try to do something that is complete taking, with no assumptions whatsoever that a person knows anything about Krishna, or anything about vedic, anything. And we also wanted to make our presentation attractive to a very specific audience. We wanted to target the, what's known as the millennial demographic, the millennial, meaning the p eople who are born, who have come of age at the turn of the century. So that means they're born somewhere around '82, '83, somewhere in that range up to, I think the cutoff is '90. Anyway, there's various definitions of what a millennial is. But in any case, there are people that are right now in the age range of about 25 to 35, generally less than 40. So we wanted to target, to try to attract those people. Secondly, we also thought, well, we definitely want to attract people in the west. Srila Prabhupada's pranam mantra is pascatya desha tarine. His mission was to bring Krishna consciousness to the western world. So that was the second criteria. And the third one was that we wanted to be attractive and appealing to the mindset of people who are, who call themselves spiritual but not religious. So we were very, very, very conscious of not coming across as another religion and putting people off in that way. So with this in mind, we started to evolve some concepts about courseware and we began putting the site together, getting some designs, etc. And we started to writing the courses and recording them. 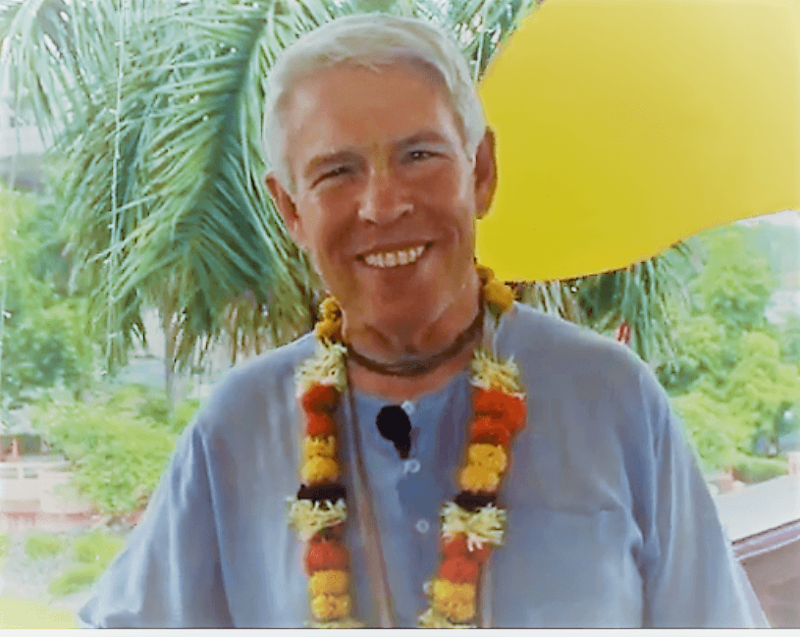 We had some devotees in America or well a few of them are Americans, but they were living in Mayapur, to record these lessons, and other devotees started putting it together, editing the videos, adding some sound, et cetera. We threaded it all together and now we have it. Now we have, the site is now complete, with our first introduction to chanting, which we call our seven-day online workshop, chanting workshop and a follow-up course which goes deep, much, much deep, more deeply into, to chanting, which is our mantra, meditation, wisdom and practice course. So these are now finished. There's a third course in the works, which is not, it's not finished yet. It'll be finished sometime in December or January, which we called sadhana. And altogether, these three courses take somebody who is not at all familiar with chanting or they might be. I mean, it's not that it's not appropriate for a person who has had some experience, but it's really designed for very, very new people who can begin to experiment with chanting the Maha mantra. The first workshop is just seven days of everyday chanting four or five minutes working yourself up to around 20 minutes, listening or watching a three, four minute video lesson and just, you know, trying it out. The video lessons are very simple, we don't get into a very deep philosophy, but we try to give some of the basics of you're not your body. The mantra is not just a string of words, it has some special power, things like that. The importance of your environment, a few little hints about our philosophy. And then we invite people at the end of it to take our mantra meditation course. That's a much more structured experience that for this workshop, you don't even have to log in, you can just watch the videos, chanting. But for the core, the mantra meditation course, we ask people to log into our site to first of all, sign up. When they sign up, they get registered, they get a user id, password and all that, and log in and watch the lessons, do some quizzes. We basically, it's not exactly requirement, but we say now you need to have a set of beads for the first workshop. We assume that people won't have or might not have any japa mala beads or might not be able to get them. So we don't even, we don't require that at all. But for the course , we say, you know, now this is time to get into it a little deeper, get a set of japa beads. And for that purpose we offer a set online. We have a, we've put together a little japa kit. People can order it, if they're in America. We don't yet have a inexpensive way. We could ship it anywhere in the world, but it would be, you know, three times the cost of the kit. So we are trying to find places that we can partner with that people can get beads and kit bags, etc from in other parts of the world. You know, set things up like that, maybe even supply them. But, for the time being, we suggest people, if you're in America, order it from us. If you're somewhere else, here's some places you can get them. Get yourself a set of beads. We even going to, we haven't done it yet, but I'm putting together a little, how do you make your own set of beads. Get some, go to the craft store and get some wooden beads and some string. I mean, that's how I, that's how I made my first set of the beads that I was initiated with. They were beads I went down to a store, bought them, strung 'em myself. So yeah, we'll have that as well. And then take the course and the course is now, now we get a little more in depth. We go more into the whole idea of bhakti yoga. And we start to talk about the supreme personality. And we end up the course, the course is designed to try to bring someone you can say intellectually and emotionally through the process of considering themselves to be in a relationship with Krishna. And considering that that relationship has all potential. Considering that I can develop this relationship. I can awaken this through this simple chanting and through this simple meditation. We also offer through the course, we offer little tips about meditation, sitting and posture and things like that, making a sacred space for yourself. Those types of things. Pancharatna Prabhu: So we're trying to kind of move people along to the point where they may consider, yes, let me be a devotee. Let me be a devotee. I mean it's a little quick, you know, it's only about 18 lessons. It's about three weeks, but it's not a pressure, high pressure or anything like that. But it's just, you know, taking people along systematically to the point that they can consider this. If I want to go further with this, if I really want to really go deeply into this chanting and this whole Bhakti idea, then I have to really consider my relationship with God and the universe and consider that it's about time that I should think about surrendering. Turning over. And then that's how the whole course ends, and then we invite people, okay, now if you want to really go for it, okay, we've got a whole whole thing for you here. We got a sadhana system and in the sadhana course we'll teach about, you know, chanting the Pancha Tattva mantras, how do you offer your food, we'll introduce Srila Prabhupada. .
We do introduce Srila Prabhupada from the beginning, but we'll get into the whole concept of a guru, the concept of shastras, of reading scriptures, the concept of following rules, of having a, you know, avoiding talk about our regulative principles, things like that. And we'll get into a little bit about the stages of development. So that's the sadhana course. And the idea is that by the end of all of this, someone who goes through Chant Now and our courses, they'll be prepared, they should be really well prepared to participate in Bhakti Vriksha programs or in temple programs or any kind of ISKCON activities that frankly do assume that people are a little more advanced than the average person. And that's actually part of the sadhana courses, sort of what a temple is like, what do you expect. If you go to a temple, what might you expect? With the earlier course, we'll try to connect people with non-temple experiences. I mean, there may be some temples that have people who are ready to receive our students and take care of them. But mostly we're gonna try to connect our students with places like the loft in Auckland or there's a place called Mantra house in LA that has weekly programs or perhaps the Bhakti center in New York or Kirtan London, you know. Those kind of environments where it's a neutral platform. You're not expected, you're not surrounded by devout mostly Hindus from an Indian background. So we want to give people a little more comfortable, relatable environment and specific people. We won't just say, okay, go show up here. And now we will say, okay, here's a person that is ready to receive you at this place. And so that's the overall strategy of Chant Now. So I hope that's explained it. Maybe there's some questions about what I've explained. Krsnendu Das: Just a comment on that last point that you made. I really liked that idea of personalism that when you send someone somewhere, that you have someone who knows exactly where they're coming from and can continue their experience. Pancharatna Prabhu: Yes, yes. And they're familiar with the language of those people and you know, it's important. So that's basically the idea. Now this is not just something where we've just put up and we're just letting it sit there. We are going to be marketing this thing. That's the other aspect of it. Marketing is an art and something that we're learning. Our primary channels for marketing are social media, Facebook, Instagram, primarily. We also are going to be marketing through the devotees, through ISKCON. I'm in a conversation right now with Vijaya, the minister, ISKCON minister of distribution about how we can connect this with the marathon and invite devotees who are out there distributing books to refer people or even to collect their contact information and we will connect with them. We'll follow up. We will answer. We'll be there. We even have a telephone number for people to call . Krsnendu Das: Yeah that makes a lot of sense because in the past, you know, there's been a lot of books that have gone out, but then the follow-up aspect of it's been really lacking and this website really seems to be a way to fill that gap. Pancharatna Prabhu: That's what we hope. That's what we hope. So we're offering book distributors a bookmark that they can give along with the books that has our information on it and we're going to offer a little, not exactly an app, although we could do that, but right now we're thinking of just giving them a specific url that they can bookmark and store on their phone and just all they have to do is type in the contact information in that app. And then the rest of it's all taken care of. So we're going to offer that and yeah, let's see. Or people can just write it down, even. They can write it down and take a photograph of it and send that to us. So you know, we'll take care of the rest, the data entry and everything. So that's a service that we want to provide, especially for the marathon. Krsnendu Das: Yeah, that sounds great because I know that you know, devotees know that following up is good, but it's very hard because it takes, to follow up online or just to follow up in general, it actually takes a lot of sort of a strategy and planning and things. So to have this resource, it's really, really helpful for devotees because instead of just kind of scribbling down an email address and then not doing anything with it, like what you were saying, they can have their phone and just say, here, put your email address right in here. Press the button and immediately they'll get an email to follow-up. That's powerful. Pancharatna Prabhu: Yeah. And the thing is that we'll have a team, we have a few people already and we're going to build it out of people that are dedicated to interacting with these people in their language. Right now it's just English, but you know, we're planning to launch Chant Now in other languages, in Russian and in Spanish will be the next next to the immediate one. Let's see, maybe Arabic. Krsnendu Das: Wow. It reminds me of what you mentioned earlier Sankarshan Prabhu' s email, his email course because I remember signing up for it a few years ago just to get the experience. And one thing I really liked about it, which is also a bit threatening in some ways, but what I really liked about it that it was very personal. He didn't just like send out a series of automated emails. That sort of scenario, here's email number one and here's email number two. But he said, here's a question for you, you answer this question and write to me, I'll write back to you. You know, there was actually a person at the other end of it and that was really powerful. I've also observed in other email lists that I've been on that when people do that and they actually speak backwards and forwards rather than just kind of sending out a broadcast, that it makes such a difference in feeling connected with the person. Krsnendu Das: So having those people, devotees who are actually dedicated to being there, you know, when people ask questions and to be able to reply to them, it's a really powerful form of preaching actually. Pancharatna Prabhu: Yeah. Yeah. Definitely. Pancharatna Prabhu: There's a demographic and there's, as you say, there's the interest. So certainly meditation is at the top, you know, people who are interested in meditation. Yoga is part of it, but that's a very broad type of thing. Certainly anyone interested in eastern philosophy would be another indication, people who are interested in self realization, those types of things. We also think that people who are vegan or vegetarian is a very good indication that they would be open and interested. Then the rest we're just kind of figuring out. You don't really know. We're experimenting, trying to develop what they call in marketing the persona or the sonas that we are trying to address. We've taken hints from Krishna, because Krishna does describe four personas, catur-vidhā bhajante māṁ. So that's another element where we've looked at the psychology of those four types in the modern context as well, someone who is distressed especially would be somebody today, at least in our efforts, would be somebody suffering from stress and anxiety, depression and loneliness, emotional distress as opposed to physical distress. There may be physical distress, but there will be more of the emotional problems that people face. Then you have the people who are desirous of wealth, right. So we figured that that's, in our context, that sort of translates into people who are looking for personal development, personal empowerment. You know, there's that whole, the whole industry, personal development industry. Pancharatna Prabhu: And so on, the secret, you know, whatever. But that also includes people who are desirous of a better environment for the world and so people who have an interest in change. So that would be a second category. And then of course you have those who are truly just actually looking for Krishna consciousness, looking for the Hare Krishna Mahamantra . That's certainly a smaller, smaller group. And then the curious. People that are curious about other things or maybe particularly in the meditation field, who may have been practicing some sort of meditation and are curious or interested in what are some other forms of meditation. And so mantra meditation might be something they would be interested to look into. So we are developing that. Our marketing strategies are still just getting developed and a lot of it is gonna be... Try out our first campaign, see what the results are. Tweak some things and see what those results are. And will also be a bit demographically specific. We'll try to target people who living in areas where there is something like mantra house or the loft... so that the people who come through, we can more confidently pass them on to other efforts. Krsnendu Das: Yeah, that makes sense. So this marketing on social media in particular, is it in the form of videos or articles or a combination? Pancharatna Prabhu: Videos... Videos... You can see when you go to our instagram slash chant underscore now, or you go to facebook Chant Now page and you'll see it. There's a combination of material including material that we're picking up from other related efforts like the Fortunate People campaign which was connected to Chant Now, or Shiva Ramaswami who's targeting similar audience as we are. So we're picking Barclay center, you know, different places where we pick, we pick up content from other people too and put it out there. Yeah. So it's a combination of videos and images. Our blog for our website hasn't really gotten off the ground yet. We have a few articles there, but others are in the works and we're looking for bloggers, people who would like to write for ChantNow.com. That would be something we'd really very much appreciate. People like to contribute content. Krsnendu Das: Yeah, that sounds good. It's a good opportunity because Prabhupada said that he wanted devotees to write. So these kinds of blogs, especially when there's a clear editorial policy, makes it easy for devotees to know exactly how they should be writing, you know, like what kind of topics and what sort of, what's the word, you know who you're talking to and you know what you're trying to achieve kind of thing. It makes it a really good service for devotees to be able to engage in because, you know, traditionally we've got Harinam, book distribution. But there's not been that many avenues for devotees to, sort of publish their writing unless it's, you know, they've created their own blog which sometimes is a bit of a challenge. But if you can plug into something which is part of a whole kind of a strategy, it's inspiring I think. Pancharatna Prabhu: Yeah, we're going to... we do invite people. I'm hoping to, you know, we wanted to get a little more of the kinks out of our systems. We kind of officially launched withan offering to Srila Prabhupada on Radha Ashtami day when I went to his room and held my phone up in front of him "Here it is..." So since then we've been starting to do a little marketing. We have some backend systems to interact with the people that do connect with us and just now we're ready to do more publicity about the site and get more people involved in contributing both the content, contributing content in that area. Also volunteering time as mentors, online mentors, you know, searchers, you should say fishers of men. But, you know, going out into the marketplaces, going out to the websites and the facebook pages and communities and groups and just listening to people in those places and responding to their interests and concerns with Krishna consciousness in their language and then connecting them to Chant Now as they want to explore further. So that's what we're doing. Krsnendu Das: Yeah. That was gonna be my next question, which you've pretty much answered is how people can get involved and so you've basically explained earlier that there's an opportunity for writers, there's an opportunity for people who like to be on social media who can interact with people and guide them through these systems that you've set up and yeah, I mean basically just direct people towards the project. Pancharatna Prabhu: Yeah. And if you have some technical skills too, we're ready to engage, particularly if you have some web development skills. Because we want to create new avenues, more sites, more like this is our first website focused on chanting. Pancharatna Prabhu: Yeah. So systematic online education, that is our primary objective. To bring people into systematic online education and to connect people with that education on site as well. That's our objective, to inform and to educate and on various levels. I mean, we can use a lot of help. Pancharatna Prabhu: We need money too if anyone wants to donate. That's also there. Krsnendu Das: Does it generate any funds on its own or is it depending on donations for it to continue on? Pancharatna Prabhu: And we don't plan on doing any advertising. So yeah, our basic revenue stream is through people donating for the courses or paying for courses and donations. Krsnendu Das: Oh, not get..I'm with you. Krsnendu Das: Not get income from the advertising. Pancharatna Prabhu: No, we're not going to put ads on our website and for people to pay for advertising on our site. We might do that on bhakti.com. On bhkati.com, we might open it up for advertising on the site. And you know, if our youtube channel were to take off then we might generate some ad revenue from youtube. But ad revenue is not our target. Our target is donations and fees for courses. Krsnendu Das: Yeah, that sounds good. It's an interesting discussion about that because, you know, there's a tradition of giving knowledge for free and then the Guru dakshina is given and yet at the same time Prabhupada's system was selling books. Pancharatna Prabhu: That's right. And people don't mind, you know, you put some effort into putting something together. I mean the knowledge that we present in our site, the way we look at it is this, we're not giving you anything that's not available for free in various formats and including on our site, on our website. We have articles, we have information, we have content that you can access all for free. So it's not that you have to pay to get what we're offering. It's not a secret mantra that, you know you have to pay money and then you get it. It's nothing like that. It's all there. It's all freely available. What you're paying for is the service of, our service of pulling it all together into a structure that makes it easier for you to digest into, to assimilate. So you're paying for that service. You're not paying for the knowledge itself. The knowledge is free. Krsnendu Das: Yeah. That's good. I really like that. Because there's so much information on the web. You can find anything for free pretty much online now, but that's the problem. It's someone who takes the time to curate it and to put it in a form that you can actually understand that and apply it. That's a really valuable service. Pancharatna Prabhu: There you are. Somebody was trying to call me and it's automatically puts the call on hold. Krsnendu Das: Oh yeah. Okay. No, I was just saying that in the internet today, you can get anything for free. There's information, unlimited information. But that's the problem is that we don't know what's authoritative, we don't know how to apply it and if someone can curate that information and put it in a format that we can easily understand and put into practice, you know, that that has a lot of value. Pancharatna Prabhu: Yes. And that's what we're offering is trying to do that for the system of bhakti yoga, mantra meditation. And eventually, as I said the other websites, bhagavad gita, kirtan, there's so many different possibilities of ways that we can offer people this opportunity. Krsnendu Das: Yeah. The different angles. One of my marketIng mentors, he talks about like an octopus. It's got all these arms going out in different places. So you know, different people will be attracted by different things, but we wanna be able to give everyone the opportunity to be attracted to Krishna in some form or other. Pancharatna Prabhu: Yes, yes. Yeah. By the way, that's another place we can use some help in this marketing. Whoever out there has a marketing experience and that'll be very helpful. Krsnendu Das: Yeah, that would be an area that I'd be interested to perhaps help. Let's see what I can do. I was just thinking, also that you were mentioning people with technical skills, you know, people that are good at making videos. That would be another area, you know, where skills would be really helpful especially this is more and more video centric it seems. Krsnendu Das: That's great Prabhu. That's awesome talking to you. I just wanted to change the topic ever so slightly at the end here. I think it's somewhat related, but you mentioned that your service has been to start projects and, you know, then when they're up and running then you let people run with them sort of thing. So I'm quite interested in it. Yeah. Yeah. So I'm quite interested in that mindset of the kind of entrepreneurial spirit in a way of trying to do new things and to innovate and to, yeah, just to start new ideas. And I was just wondering what you think is what led you to that type of life or way of doing things and is there any way that we can encourage devotees to have the same sort of mentality of innovating, you know, rather than just following along with the program sort of there and to have some sort of creative ideas like that. Pancharatna Prabhu: Well, I think that the, at least when I look at my own life, I always, in one sense I respect and I honor the devotees who are just, you know, steadily maintaining things. I think it's also, to a large extent, it has to do with our psychic nature, the kind of brains we have. I have a particular kind of brain that just doesn't like to stand still, you know, it's a problem. But, you know, I tried to sit down and meditate and chant attentively and I'm always thinking about so many things. And also very curious about things, you know. So that kind of lends towards this idea of solving problems and trying to, you know, planning and creating different approaches. So I think it's, to me, it's more of a question of looking in yourself and discovering where your creative energies are, where are the areas... Like, for example, my wife is very creative in the kitchen department and then the arts and crafts and she's also very creative in her service as an astrologer. She's a vedic astrologer, so these things kind of gel with her own psyche and her psychic nature or developing the park here for the children and teaching children. And so I think that it's, first of all is to seeing where is your particular channel of creativity and innovation And then getting into that, into that area. And the second part is just to put aside the notion that there's something wrong with that. Sometimes people, you know, do have that idea that I shouldn't innovate, I shouldn't change, I shouldn't try something new. You know, it's all there. Particularly in Krishna consciousness. You hear that sometimes there's no need for anything new because everything's there already. But that wasn't my education. From the very beginning of my association with Krishna consciousness, I was interacting with people who are very innovative and trying new things and we discussed and brainstorm. So I think there's also a culture that is important where innovation is respected and where people have, you know, are ready to fail, also, which is another big aspect. And understanding that this is a quote from life I heard a few times this last meeting in Kanpur. I think it's Churchill, I think actually "No failure is fatal". No...alright. So you can, of course or something, he told me. But anyway, but generally speaking, when we attempt something and we fail then okay, we try again. So you know having that, that attitude and, you know, being comfortable with the idea that this might not work, but it's worth a try. Without being reckless, we can still take risks. Right. So that's, I think important. Krsnendu Das: Yeah, that's great. Yeah. And I think that this project is a classic example of that kind of thing, as you mentioned earlier, that you've got some marketing strategies and you don't know what kind of response you'll get, but unless you try it and try to apply this, you wouldn't really know if it works or not. And then you also won't know what you need to change until you try it and get some results. Pancharatna Prabhu: That's right. Exactly. Krsnendu Das: Yeah. That's fantastic. Now, you've mentioned a whole lot of ways that debate is, can get involved in this project, but how would they actually get in touch? What's the best sort of channel to get in touch with you or someone else? Pancharatna Prabhu: Email is generally the best, although whatsapp is also still is okay. Those are the two best ways for me, email and whatsapp. Yeah. Krsnendu Das: That's great. So have you had any final words you'd like to share with anyone that might be listening, you know, in relation to this project or, you know, just the general idea of spreading Krishna consciousness online. Pancharatna Prabhu: Well, I think we all have to be very awake and aware, continually of the need for Krishna consciousness in the world and looking for opportunities. The online arena is pretty much in its pioneering stages for us, although we're behind many others. It's not like no one's been trying to spread ideas on the internet. Everyone's doing that. But our ideas have not really been promoted, certainly not as they are. Unfortunately, there are people that have been promoting and talking about kirtan online. There's people talking about bhakti online. And the way they present bhakti and the way they present kirtan doesn't connect people with the complete picture. And sometimes is perhaps even a little misleading in terms of the role of various demigods, et cetera in the process. So we do have a challenge in front of us. But the rewards, the potential is huge and it's not that difficult to get into it. It takes a little time and an effort. But the main thing that it does that helps in this respect is to think, "Let me do this with others". When you're going out to distribute books, you might say, well, oh hey, all I need is just, I get a box of books and I'll go and I'll just find some place and I'll distribute them. Because somebody else has done all the work for you. Namely the BBT, they printed those books and all you have to do is get them and have them out. We're not at that place yet with the internet that you can just jump in and just do a little bit of a thing. So to get involved in this whole area needs to become part of a team. And we're offering that, we're offering the opportunity to be part of a growing team of people that are trying to make a difference in people's lives through the internet. Krsnendu Das: I really like this wonderful way to end, you know, when you talk about sankirtan it's about working together and spreading the message of Lord Krishna and it sounds like that's the spirit that you have started this project and I look forward to seeing it keep growing and expanding. So thank you very much for your time Prabhu, that's been really great and I'm sure that devotees who'd listen will be inspired and you might need to find a new manager who can manage all the emails that will be coming in to your inbox of people wanting to get involved. Pancharatna Prabhu: I hope so. Thank you. Krsnendu Das: Yeah thanks a lot Prabhu. Hare Krishna. Pancharatna Prabhu: Hare Krishna. Haribol. Krsnendu Das: Thanks for listening. To find out more, go to successfulvaishnavas.com. Akrura Prabhu: We know that they have much more intentional than they're presently using. Urmila Mataji: I am into a place of relishing the activity and letting go of the result completely.